Whether I am planning or managing a wedding, engagement party, birthday or any other event, it is simply the little DETAILS that gets over looked that makes a difference. When working with my event clients, my goal is always branding through personalized WOW factor - which leaves an impression with clients and their guests and sends a message about my brand value. The business of event planning falls under the HOSPITALITY umbrella, and relies heavily on word-of-mouth. A client, and or their guests are likely to be a returning or future client, so my team of event professionals knows we need to delight by creating personalized WOW factor that is memorable for all the right reasons. 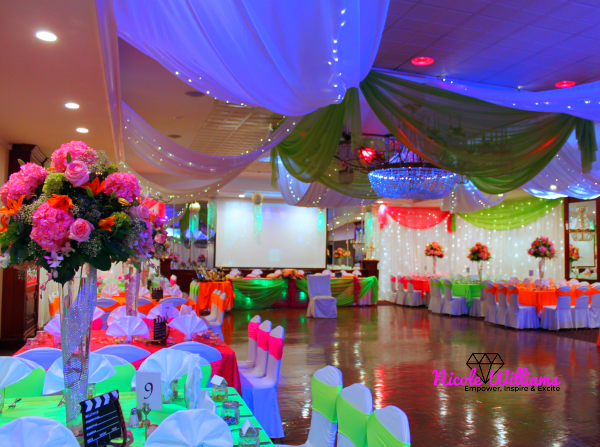 Like the beautiful pic above, see more from Nia’s Neon Hollywood Sweet 16 here. FIRST IMPRESSION: I ensure that no matter how a potential client first interact with my brand [social media, email, phone or in-person], that their interaction is always positively consistent with how I want my brand to be perceived. ENSURING MY PERSONALITY & BRAND VOICE SHINE THROUGH: I always make sure to service with a smile. That I am personal while maintaining my professionalism, and always wearing my passion on my shoulders. I try to deliver on my client’s wishes while making their guests feel valued. TAKING REAL INTEREST: Taking real interest is a great way to get tips and hints to help create a personalized wow factor. I listen and ask questions to enable me to add value in areas least expected, ensuring each event unique. How do you go about branding through personalized WOW factor?